By Allen Fox: Leonard Ellerbe, the CEO of Mayweather Promotions, sees WBA junior middleweight champion Miguel Cotto (37-2, 30 KO’s) as being a really risky fight for Floyd Mayweather Jr. (42-0, 26 KO’s) to be taking in his next bout on May 5th due to his power. The weight could be a problem for Mayweather, because he’s only fought at 154lbs once in his career and he’s facing a fighter that could be above 160lbs on May 5th. Cotto reportedly weighed 165 when he stepped into the ring in his last fight against Antonio Margarito last December, and at 5’7”, Cotto looked huge, like a small tank. Mayweather says he walks around at 150lbs, and he’s not likely to gain weight just for the sake of gaining it. If Maweather tries that, it may backfire on him by making him slower and more beatable against Cotto. It’s going to be interesting to see if Cotto comes in a little lighter for this fight so that he can have better speed and maneuverability to deal with Mayweather’s hand and foot speed. Cotto needed size for his last fight against 5’11” Antonio Margarito last December, but he might want to consider trimming down a little for this bout because Mayweather Jr. isn’t slow like Margarito. This will be the 31-year-old Cotto’s third defense of his World Boxing Association title he won in June 2010 with a 9th round TKO victory over champion Yuri Foreman. 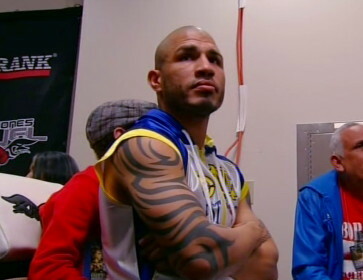 In two defenses, Cotto has beaten Ricardo Mayorga and Margarito. Mayweather presents a huge step up in class compared to the last three fights for Cotto.